The Six of Cups Tarot card is a call to reconnect with our inner child. Linked to nostalgia, ingenuity, innocence, and generosity, this card of the Minor Arcana opens the door to reflect on the way we see the world. In some cases, this card refers to people who have been stuck in the past, living as adolescents or children, denying their responsibilities and roles as adults. On the other hand, this card can also refer to people who have hardened their hearts and need to remember what they were before, in their more innocent years. Of course, the Six of Cups Tarot card is not about clinging to the past. Instead, the message of the Six of Cups Tarot card seeks to evoke the most innocent attitude of our childhood so that we can take a fresher look at the things that are happening to us in the present. Some people can take this attitude to the extreme and turn it into an escapist maneuver, with which they evade their current reality and cling to memories, relationships, or aspects of their lives that should be in the past. The Six of Cups Tarot card is a creative card, playful and full of positive results when it appears upright. When it appears reversed, we might need a push to abandon certain childish attitudes that are preventing us from moving forward with our projects and relationships. Upright: Kindness, generosity, forgiveness, agreement, sharing, innocence, compassion, memories, sentimentality, nostalgia, return to the past, decisions, uncertainty, fear of change, old friends. 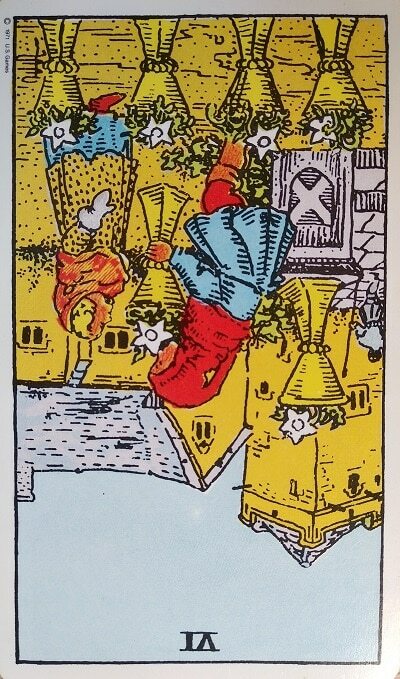 Reversed: Anxiety, future, new projects, renovation, stagnation, clinging to the past, outdated ideas and perspectives, not living the moment, freeing oneself from unwanted obligations, guilt. 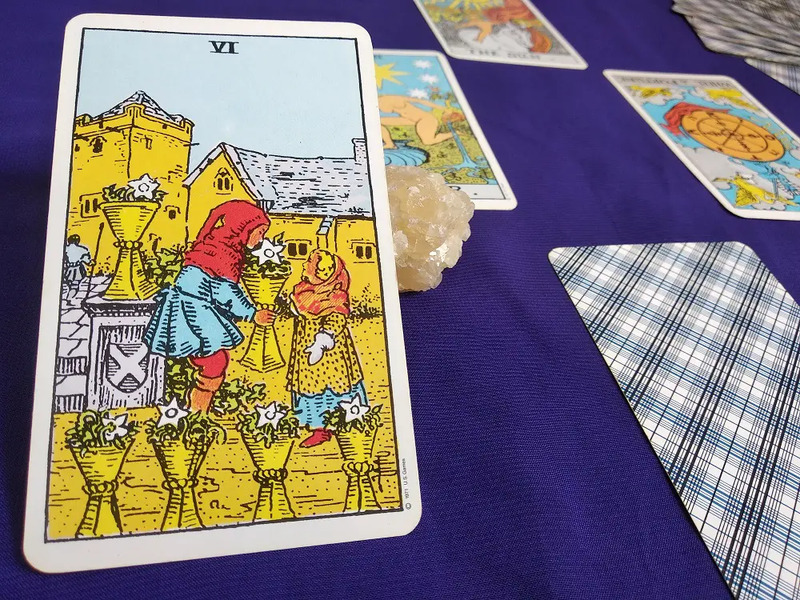 In the imagery of the Rider-Waite Tarot deck, we find that the Six of Cups Tarot card shows a scene in the middle of a city reminiscent of the Middle Ages architectural style. In it, a young man dressed in the manner of a buffoon gives a little girl a cup that contains a white flower. Near them, 4 glasses with white flowers brighten up the scene. The sixth, much larger, is located behind them. Innocence is a large part of the message that the Six of Cups Tarot card has to convey, both in the white flowers and in the fact that the central characters of this card are children. It is essential to consider that our relationships with our past and with our childhood friends are coming back to meet us in the present. The cup that both children are jubilantly sharing is related to traditions, values, and family love. The castle in the background (as well as the guard) reflect that these children are completely protected and safe, that there is nothing to be afraid of, and that they can play and share freely. Everything in this life is a gift that comes with a valuable lesson. It is your attitude that changes the focus of things. The Six of Cups Tarot card is an invitation to relive the significant moments and relationships of our childhood. The people with whom we share important memories, our close friends, and our family are vital elements of that time. Are you constantly reminiscing about those “good old days”? Maybe there is a lesson you have yet to put your finger on. We know that reconnecting with your inner child is a painful job, but it is a necessary step towards maturity. In a spread in which the Six of Cups Tarot card appears, it is imperative that we ask ourselves about our childhood. Whether it’s a return to our hometown or an issue that we still need to process, this card stands for everything related to those years. Whether it’s going to a high school meeting or catching up with a relationship from our sophomore years, this can be a time of rejuvenation, enjoyment, and creativity. It could also mean that hanging out with younger people will reactivate this process or teach you an important lesson about innocence. The Six of Cups also suggests the need to pursue your goals. If you feel incomplete, dissatisfied, or anxious, it may be necessary to work in therapy with your inner child, seeking to reconnect with a time of positive feelings and enthusiasm. In discovering the traumas and blocks of your childhood, you can take control of your life and rethink your projects with a more satisfactory perspective. In the long run, this will allow you to go further and, at the same time, feel more satisfaction during and after reaching your goals. The Six of Cups Tarot card can also refer to all the children in your life. It may denote a pregnancy, birth, or adoption, depending on the other cards in the reading. It can also indicate that you are about to spend more time with small children, playing, laughing, and learning together. Children play an important role in your present life, and they can provide a lesson of patience and love. The innocent vision of a child is dazzled by each novelty, each change, and each new emotion. Kids experience the world with wonder and in the same way, we must embrace every new adventure and opportunity. Not everything in life is given to you, and there are some things that you have to work hard for. You can still enjoy the pleasure of being alive every morning, though. Be grateful, and you will experience new ways of contemplating the world. 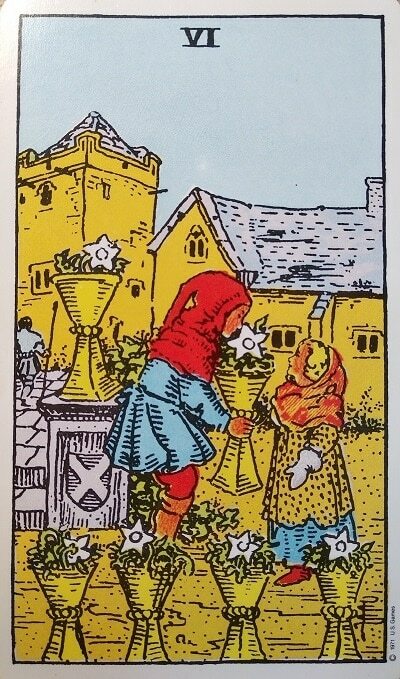 Gifts, approved projects, loans granted, and celebrations are some of the wonderful omens that the Six of Cups Tarot card brings you as long as the other cards of the spread are positive to this flow of abundance and love. When the Six of Cups Tarot card appears upright in a spread about love, we are in a moment of great passion, understanding, and romanticism. This moment could be crowned by pregnancy, a commitment, or the first step towards a more stable relationship. Your home and your relationship with others will be full of harmony and candor. Keeping your mind positive has helped you to recover from the health problems that you have been having. Keep on focusing on your positive feelings, and you will be able to recover fully much more quickly than you expected. You are about to realize a great project, close an agreement, or achieve the promotion for which you have been working very hard. Don’t worry if a business or investment hasn’t given you returns yet because you will soon be receiving the profit you expected. Economically, this card speaks to a time of shared expenses and gifts. It is important to remember, however, that the cards should always be analyzed in context, taking into account the other cards to which they are attached. As is common with most of the cards, when the Six of Cups Tarot card appears reversed, its meaning changes dramatically. We often find that its meaning has also reversed. Sad memories of your childhood and adolescence that left you marked are some of the things to pay attention to when this card appears reversed. On the other hand, the querant may be going through a stage of self-absorption, refusing to start a relationship or to reconnect with people who were very important at some time in the past. Reflection, meditation, and expansion are some of the challenges suggested by the reversed Six of Cups, and the necessity of leaving blockage and stagnation behind. Let go of resentments and focus on living in the here and now. The reversed Six of Cups Tarot card presents us with two main scenarios in a love-related spread. On the one hand, the querant may be clinging to a love of the past that doesn’t allow him or her to advance in their new relationship. On the other hand, we may find someone who has renounced new relationships because of past deceptions. In either of these cases, it is essential to dare to live new experiences. Protect your children from any threat, person, or strange situation. Do not take your health for granted. Remember to get the exams and evaluations necessary to keep everything under control. You may experience stagnation and disruptions in your professional relationships due to a tendency to close yourself off from the opinions and advice of others. If you want to grow in a business, a career, or a profession, it is essential that you learn to listen to your advisers and co-workers. Otherwise, you may not be able to find the right solutions to the problems that will arise in the future. Perhaps the reason why you haven’t had much luck in your investments and savings is that you have idealized the money without realizing the true value of hard work. This is not a kid’s issue; if you want to thrive, you’re going to have to be disciplined and work hard. The six of cups tarot card is a call to reconnect with our inner child. It is linked to nostalgia, ingenuity, innocence and generosity. Learn more here.